That was said as part of a discussion on HIV vaccines, but let’s think about it from the influenza side. Why is it true? 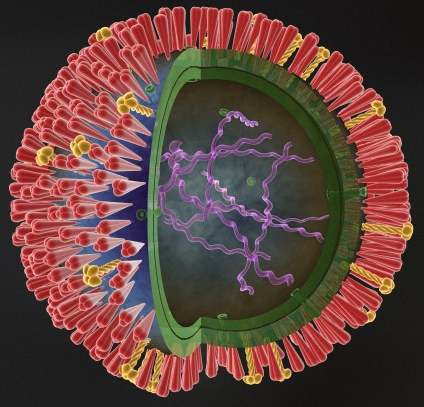 Why doesn’t influenza have as many variants as HIV? 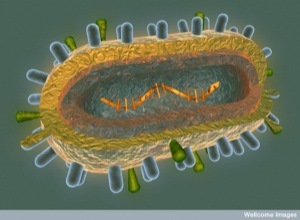 We know that influenza, like other RNA viruses, is prone to mutation (that is, it has an error-prone polymerase). Depending how you measure it, it’s likely that almost every new influenza genome has at least one mutation in it, meaning that every new infected animal or person should be be generating thousands upon thousands of new influenza variants. Globally, of course we do see thousands of new flu variants each year.2 But, based on replication fidelity, you’d expect to see a lot more — maybe not quite as many as HIV, but not far from it. I don’t know enough about the computational side to comment on their bioinformatics point. Another recent paper4 uses a similar approach and (at least at first) seems to reach an more conservative conclusion. They talk about “quasispecies”, but they seem to be using the term rather loosely, to describe just a handful of distinct genomic sequences. These sequences differ by, for example, a single base (and a single amino acid) in the HA, where one of the sequences was present at about 75% of the sequences, and the other at about 25%. To me that’s not really a “quasispecies” — a quasispecies is something that needs to be defined by an average sequence even though the vast majority of the genomes are different from that average. (Here and here are Vincent Racaniello’s explanations at The Virology Blog.) Two sequences is just two sequences. However! The authors do make their data available. I don’t have time to do a detailed look, but from what I think is a very conservative analysis, in one stretch of just 25-40 bases some 5-10% of the genomes have at least one mutation.5 If that’s roughly true across the whole genome, then each genome would have, what, maybe a half-dozen mutations on average. That, to me, really is a quasispecies. There are a myriad of complicating factors separating the error frequency in these genomes from the raw error rate of the viral polymerase. A couple of huge ones: These viruses had undergone a bunch of replications in the host – this isn’t the error rate per replication cycle, it’s the cumulative error rate after many cycles. The virus was from a patient who had died with (and probably of) the virus, and though we don’t know how many time the original infecting virus had replicated it was at least a half dozen cycles, perhaps two or three times that. On the other hand, during those replication cycles, many mutations (quite likely even the great majority of them) would have been deleterious or outright defective, so most of the mutations would have never propagated but would have just silently disappeared and not been counted at the end. The most interesting point is that these mutations aren’t arising in a vacuum. Thinking now about which mutations survive and get detected, not the baseline rate of mutation formation: The variants are forming are in an environment that’s designed to be very hostile to viruses. 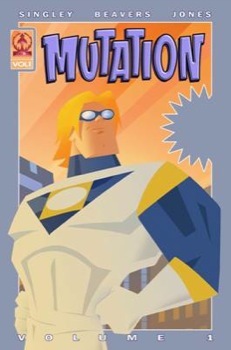 Mutations are going to undergo selection by the immune system. This is one place where influenza is going to experience a very a different set of pressures than HIV. HIV persists in the presence of the adaptive (T cell and antibody-based) immune response, whereas as the adaptive response kicks in for flu the virus gets evicted. HIV therefore not only have a much longer period (years instead of days) to throw out mutations, it also is shaped by the immune response. By comparison flu would probably only have a couple of replication cycles in the presence of an adaptive response. The variants that replicate best in a host may be quite different from those that are effectively transmitted. That is, there may be multiple sources of selective pressure, of which we have previously mainly only seen transmission pressure (because that’s the main one that will accumulate in a population, because transmission represents a bottleneck in the virus’s evolution [link to The Virology Blog]). The particular HA variant that was picked up here (that apparently accumulated during the infection) is rare globally. Is that a version of the HA that’s more efficient within a host, but that doesn’t transmit as well? This sort of deep sequencing experiment on influenza will probably be improved over the next few years, and I’ll be very interested to see just how much variation there really is within on flu-infected host.